Russian Prime Minister Vladimir Putin has warned Western countries against attempts of meddling in the Arab world to try to impose democracy. Speaking after talks with the EU leadership, he said that previous efforts along those lines had led to victories for governments the West is now fighting to contain. “Today, we say we're concerned about things happening in Libya. 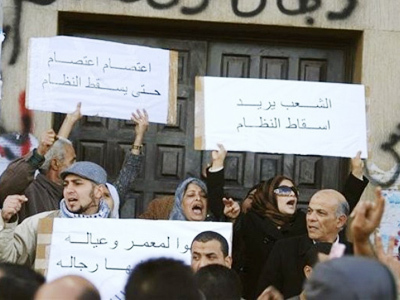 But the North African cell of Al-Qaeda is also concerned about what is happening in Libya. Do you think this is a coincidence?” the Russian PM asked. “I would like to go back in history a little bit. The former leader of the Iranian revolution – where did he live?! He lived in Paris and as a whole he was supported by the Western community. 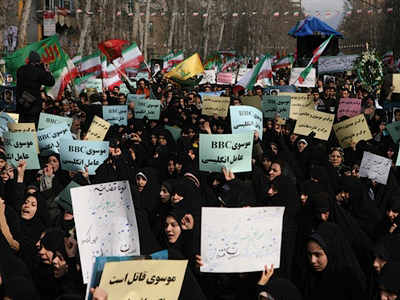 Now the entire Western community fights against the Iranian nuclear program,” Putin pointed out. “I remember just recently our partners were very active in supporting democratic elections in the Palestinian autonomy. And Hamas won. And immediately they declared Hamas a terrorist organization and started fighting against it. We need to give people a chance to determine their future themselves. We need to give them an opportunity to take a natural way without any foreign interference to build their future,” he concluded. Meanwhile, Libya’s leader Colonel Muammar Gaddafi is desperately clinging to power, despite facing more defections from his own rule. He is battling to shore up control of the capital Tripoli and western areas, with protesters consolidating gains in the east of the country. 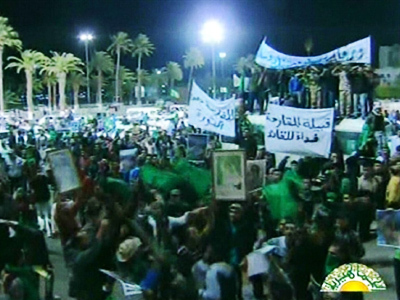 Tripoli remains heavily guarded by pro-Gaddafi forces, with tanks deployed around the city. The leader has called on thousands of mercenaries to defend his bastion, as he is faced with more defections from his own regime. 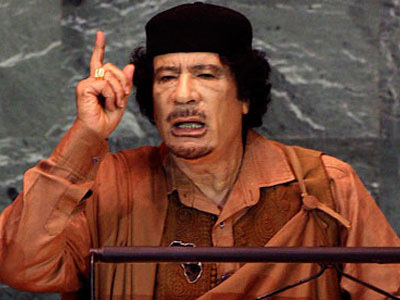 In a speech on state television on Thursday, Colonel Gaddafi said that he believes Al-Qaeda's Osama bin Laden is behind the violent uprisings in Libya. Speaking by phone from an unspecified location, the leader described the anti-government protesters as young people who were being manipulated and possibly were acting under the influence of drugs. The overall death toll has been difficult to determine. Conflicting reports put the number between 300 and 2,000. Many foreigners caught up in the trouble are attempting to flee. Russia has flown most of its citizens out with the remainder being taken to Turkey by ferry. ­John Graham, former US diplomat at the US embassy in Libya, recalled how Gaddafi started his career. Graham told RT that the main reason why Libyan unrest is so different from the situations in Tunisia and Egypt is the country’s military. The international community should not underestimate Gaddafi amid enthusiasm about possible victory of the opposition forces in Libya, believes journalist Ian Birrell, former deputy editor of The Independent. “I think he will do whatever he can to remain in power. I think we’re seeing that with this talk about more firing on people in Tripoli. We’ve seen machine guns, we’ve seen anti-aircraft weaponry used on people. This is a man who has shown himself to be utterly ruthless, and that’s why he stayed in power for more than 41 years,” he said. A political expert from the Moscow-based Institute of World Economy and International Relations, Igor Khokhlov, points out that the influence of Al-Qaeda and jihadist networks all over the Muslim world should not be underestimated. Khokhlov believes that the Western countries and the United States do not understand some vital things about the Arab world. ­With Libya following the revolutionary path of Tunisia and Egypt, some experts believe the outcome of the revolt there will be different. Dr. Orit Gal an expert in international relations says it is really hard to determine whether the ongoing crisis in the Arab world is actually democratization. “What we’re seeing here today in the Middle East, is probably not so much as an actual change in a positive direction that would bring any benefits to the people, but more of the same – I would suggest – reshuffling furniture in the same house,” he explained. ­The EU is considering sanctions against Libya due to its leader’s bloody crackdown, while the Swiss government has already ordered a freeze of any locally held assets belonging to Gaddafi. ­International relations expert Mark Almond believes there is a big dilemma for the West regarding North African and Middle Eastern unrest, as on the one hand they want democracy to be established there, but on the other, they also want a state that will be friendly to the Western powers. “But almost certainly, Arab democracy is going to be a great deal less comfortable for the West than Arab dictators, Arab autocrats, Arab monarchs have been,” said Almond. ­Ahmed Badawi, co-founder and co-executive director of the Berlin based think-tank Transform, believes a large part of the unrest in the Arab world, which took everybody by surprise, is an outcome of the Western policy that kept supporting Arab dictators and failed to correctly understand the mood of the people. “While the leaders were continuously losing their legitimacy, there was this faulty assumption that we [the West] can rely on leaders like Mubarak, Ben Ali and even Gaddafi, in the last few years, by giving weapons and arming these leaders to the teeth, thinking that they will be able to control their populations. 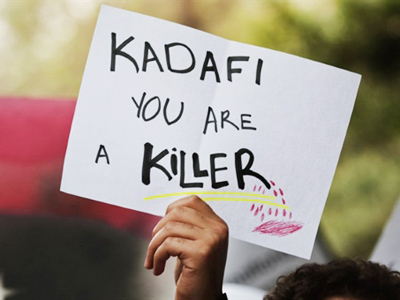 Of course, that proved to be a very faulty assumption, indeed, on behalf of many people in the West,” said Badawi. ­The current situation with the rising oil prices may not lead to another economic crisis, but will definitely become a challenge for many countries, making economic recovery more difficult for them, says Dr. Manouchehr Takin, Senior Petroleum Upstream Analyst at the Centre for Global Energy Studies in London. “Even the United States – it is importing about ten million barrels per day, and when the prices go up by a few dollars a barrel, it’s a huge quantity, and the United States has already a major account deficit, and this will be on top of that. Look at India and China, which are net importers, and the African countries…It will be having effect on those countries definitely,” said Dr. Takin. ­Robert Naiman, a contributor to the Huffington Post and the policy director of the Just Foreign Policy group, does not expect the UN to intervene in Libya. This kind of decision will not be authorized by the UN Security Council as the whole situation in Libya is under the very close scrutiny of the entire international community, and such a move could provoke multilateral intervention. Naiman says it is important ‘not to get in front of the people moving forward’. But this does not mean that the worldwide community cannot be involved, at any rate. Humanitarian aid, for instance, could always be provided. Whatever assistance might be granted to the region, it should be in line with international law, concludes Naiman.